Our final pack meeting of the year! Yeah. Am I the only one this happy? It was a good year. 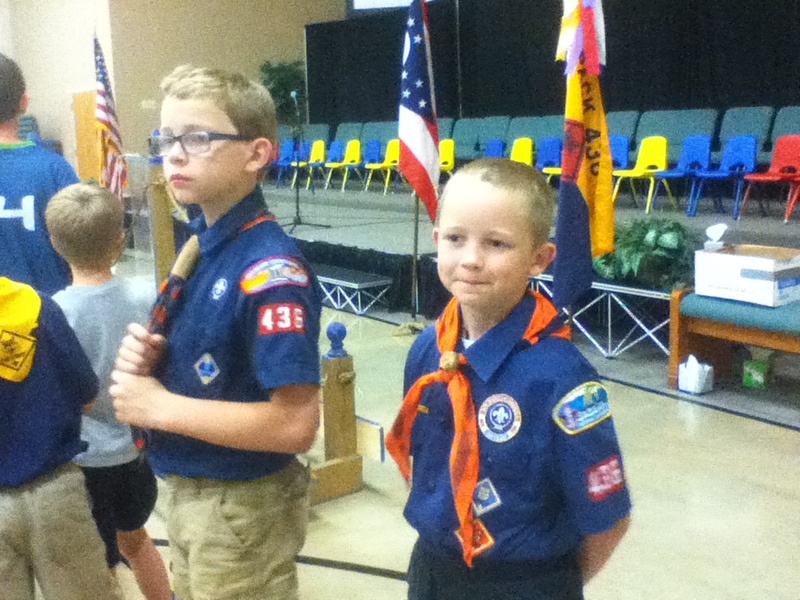 Both of my younger boys moved up in their ranks. 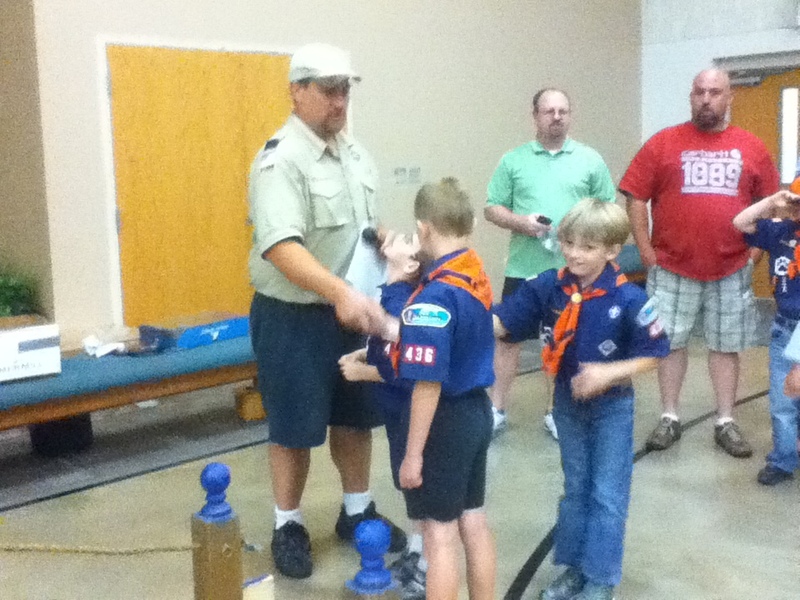 Next year we will have a Webelos 2 and a Wolf. They both love Scouts, but I think we are all ready for a break for summer. Bring on the pool, zoo, free time, and sunshine! T and S receiving an award for selling popcorn for our Pack. S crossing over our packs special crossover bridge. S shaking hands with his pack leader after crossing over from Tiger to Wolf. T crossing over the bridge. Of course he wouldn’t look at me! T leading the closing ceremony in front of a crowd of people! M thrilled to be having his picture taken. 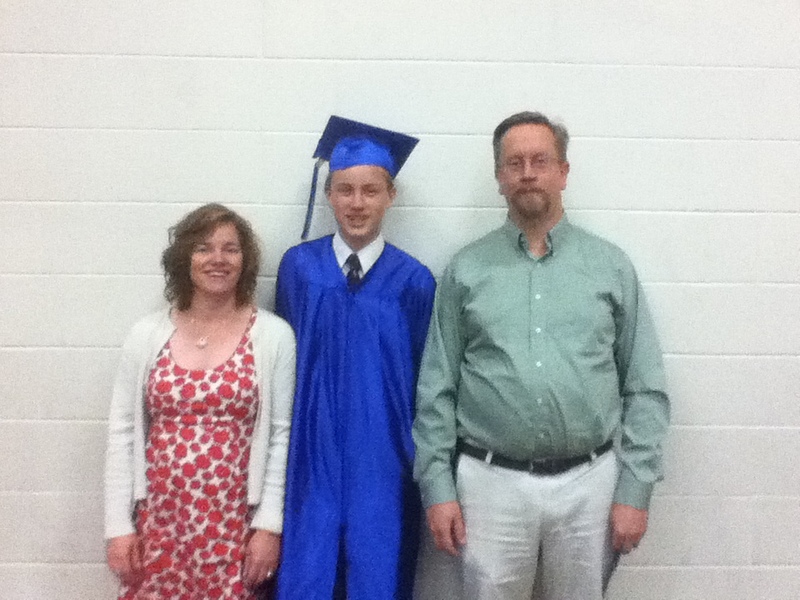 We recently celebrated M’s 8th grade graduation. He has been at the same school since preschool. 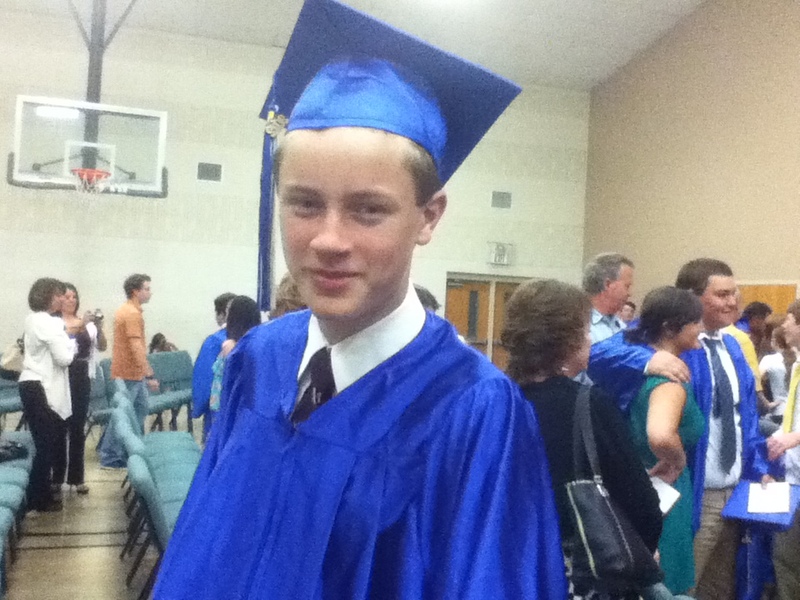 It is a small private school, so I thought he might be sad to have it all ending, but instead he can’t wait to get to high school, where there are more kids and tougher challenges in the academic areas that he is interested in advancing his knowledge. I never realize that I am so short until I see myself in pictures. In my day-to-day life I never feel short! Beginning of the ceremony. Heading up to the stage. 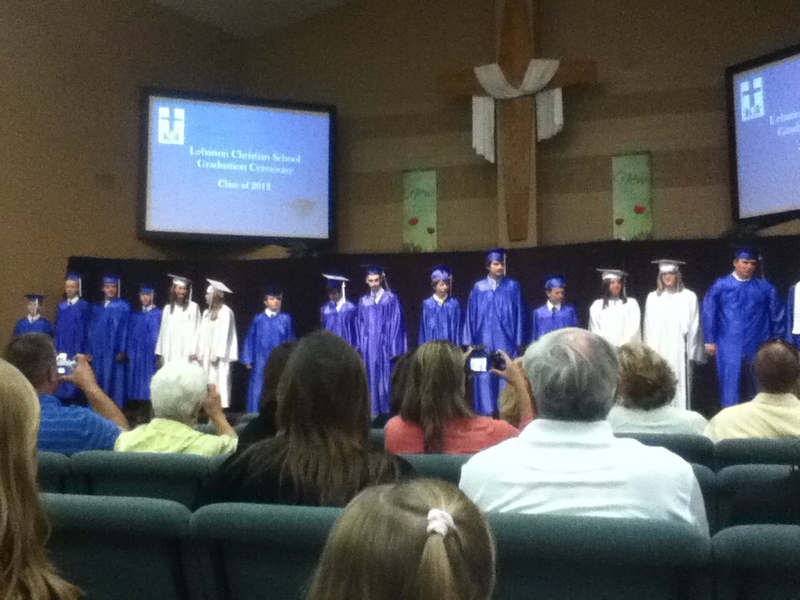 All of our 8th grade graduates! My mom, mother-in-law, husband, M, and me after the ceremony. J and R with M, the graduate. The other three kids were “babysitting” Grandpa W. They were having movie night. 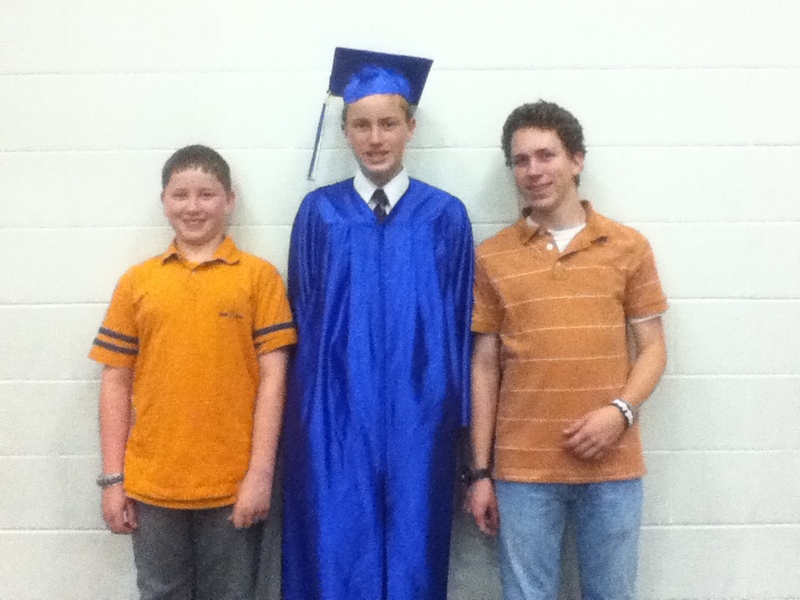 It is both sad and exciting to see your kids growing up! 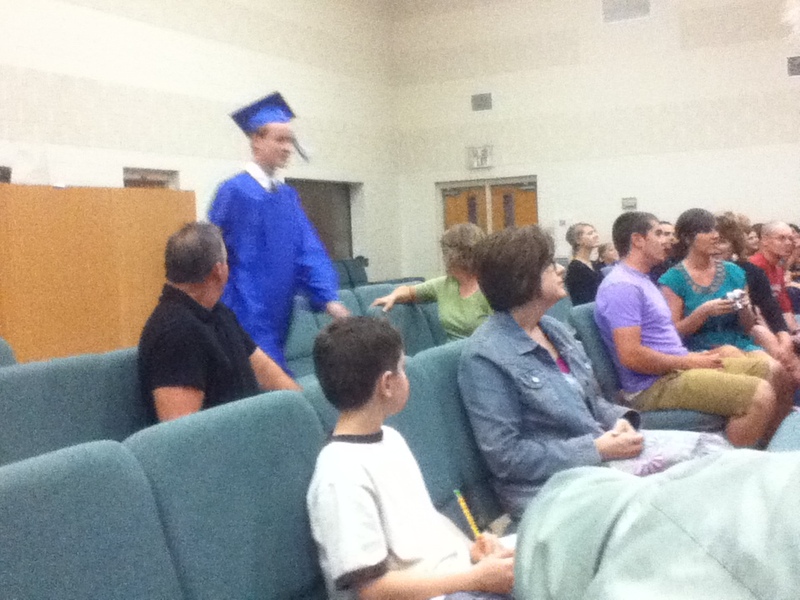 I am so proud of M. I know he is ready to take on the challenges of high school. I can’t wait to see how he adapts to all of his new circumstances. Go M, you can do it! Our Junior High did a band and choir did a performance for our local MRDD. 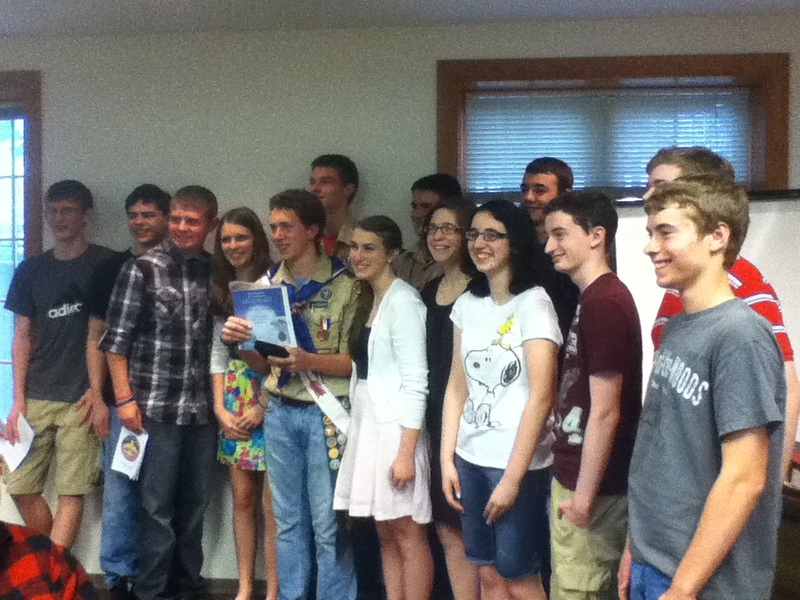 I have some pictures of our program. 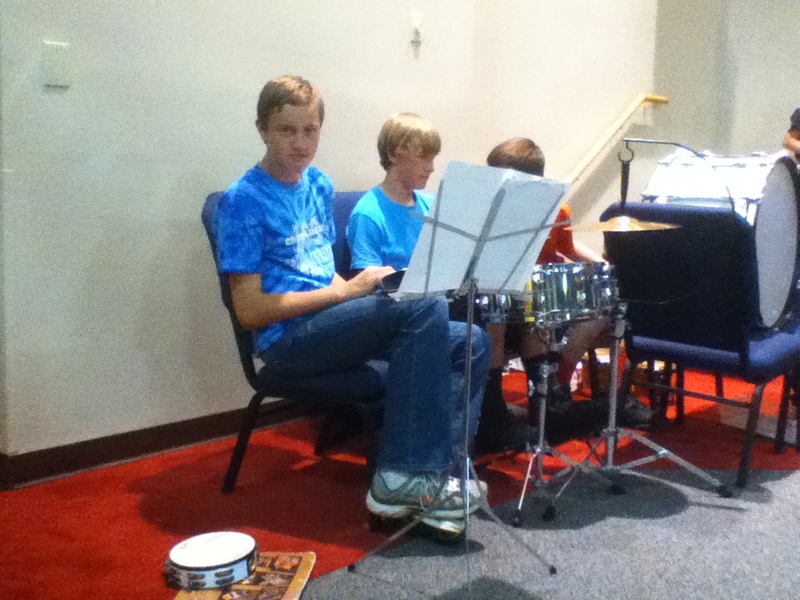 M doing the tambourine for the band. He is in the phase of hardly ever smiling! “Surfing USA”. R is driving the “car”. 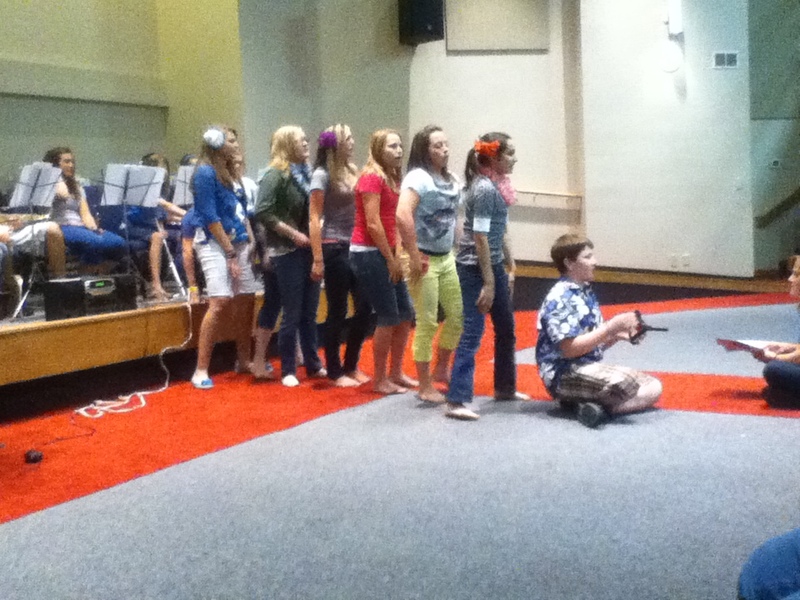 The band and choir enjoyed doing their performance, but the MRDD people “loved” it. They were clapping, singing, and dancing in and out of their seats (as able) to all of the songs. They really enjoyed the performance and were so thankful for our school to come. It was nice for our students to give back to the community in this way! 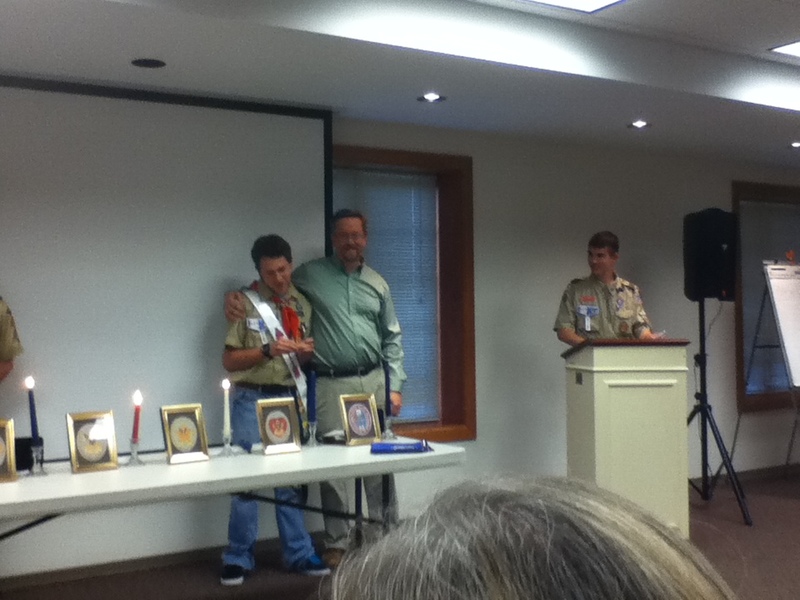 My oldest son J got his Eagle Scout in December of 2011, but he just had his Eagle Scout Court of Honor this past weekend. After finishing his requirements, he had to wait to get his requirements verified and then the COH pins etc. 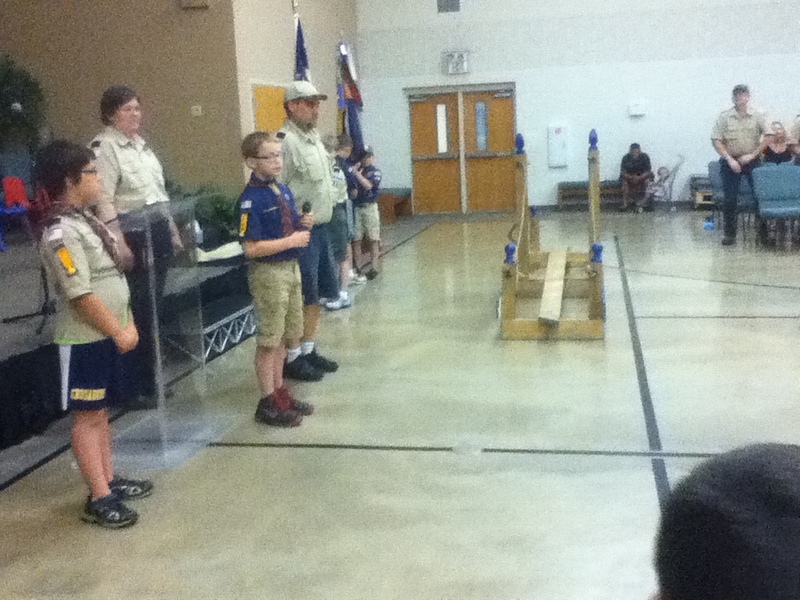 sent up to our Scoutmaster. 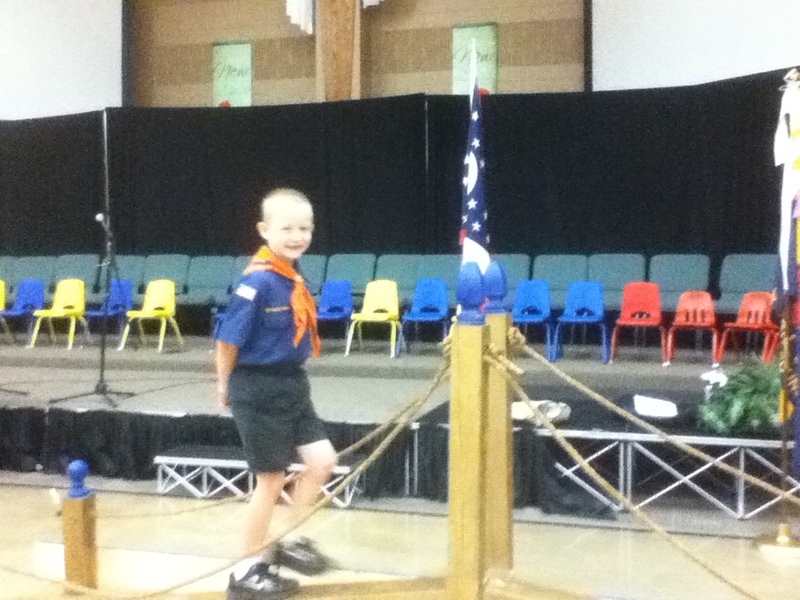 J and his fellow scout Zack had their COH together. 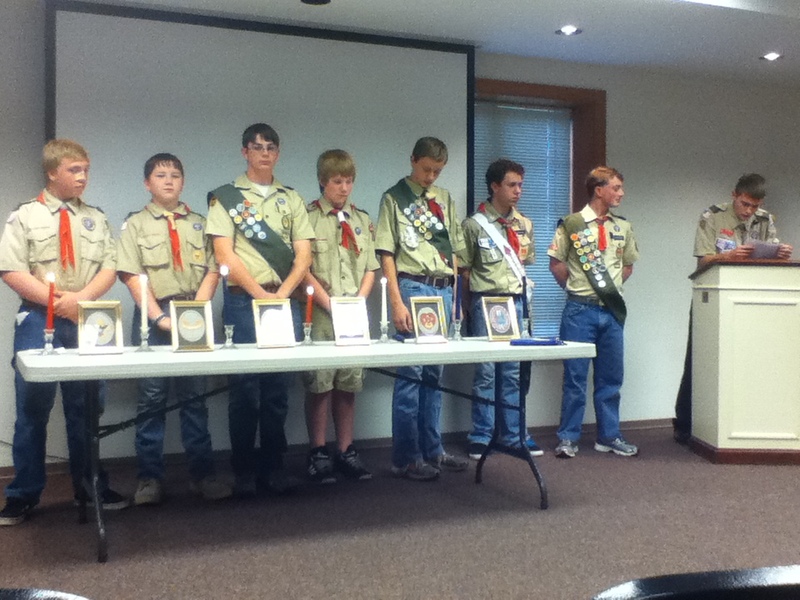 We have had several Eagle scouts in the past year or so, so they thought if they had it together it would be less of a burden for the scouting staff and since both kids have most of their family out-of-town, they thought that they would have a better turnout with one ceremony held together. 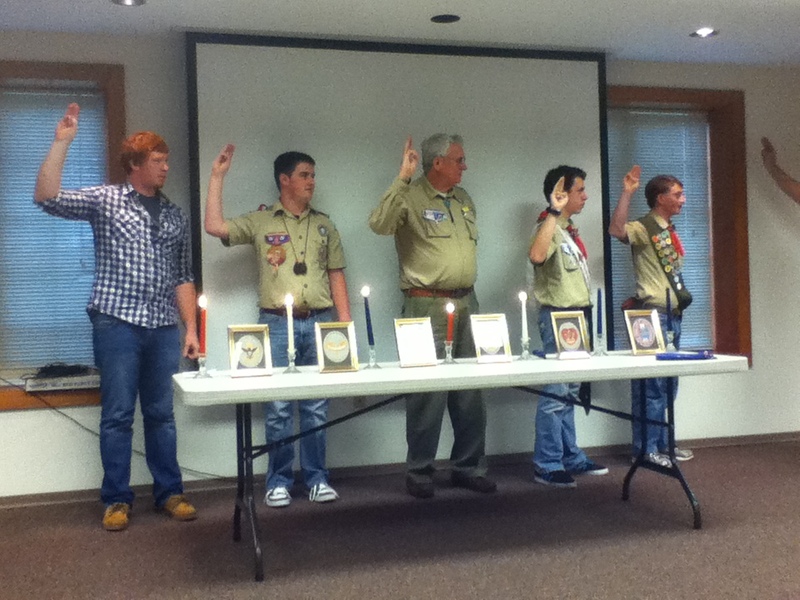 I wasn’t sure what to expect since it was my first Eagle scout. It turned out really nicely. J and Zack at the beginning of the ceremony. 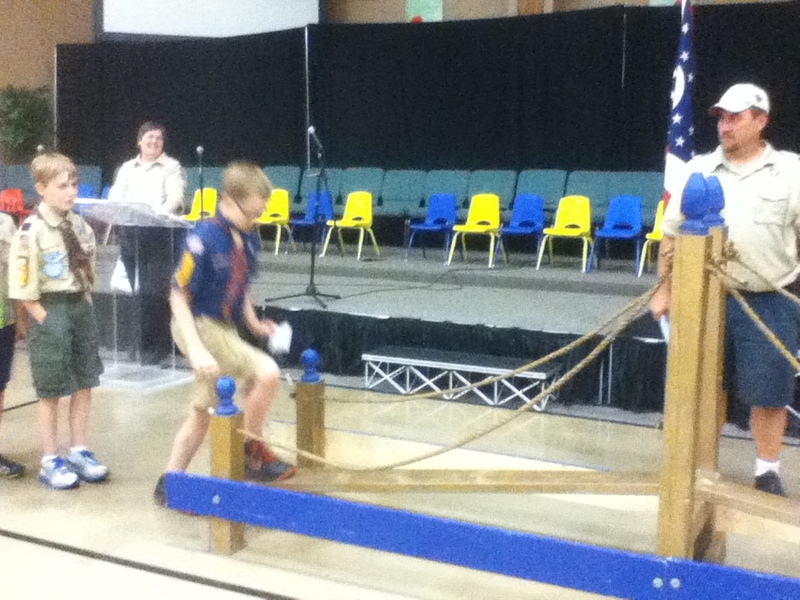 Scouts in our troop doing the “Trail to Eagle”. M and R my 14 and 13 year olds are up their participating in their brother’s COH! 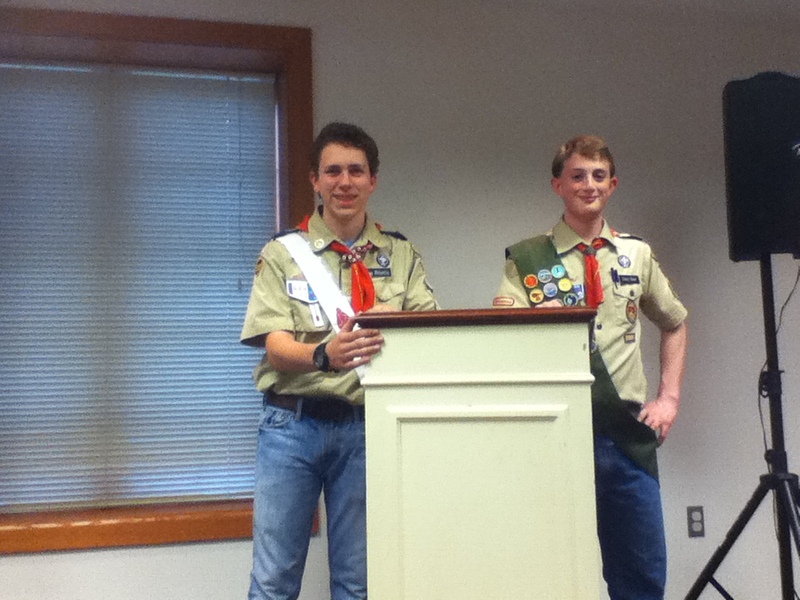 All Eagle Scouts in the room came forward to recite an Eagle Scout saying. 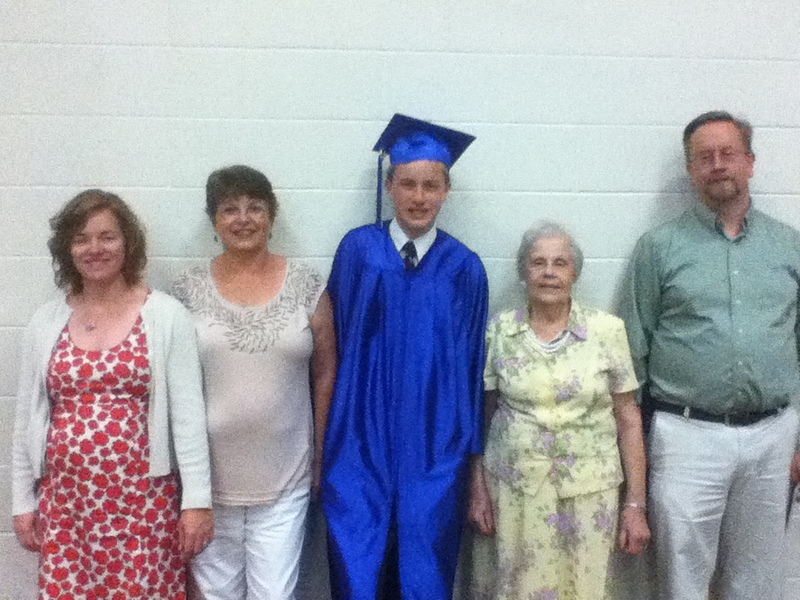 My husband up front with J.
J with his paternal grandparents! They are so proud of him! 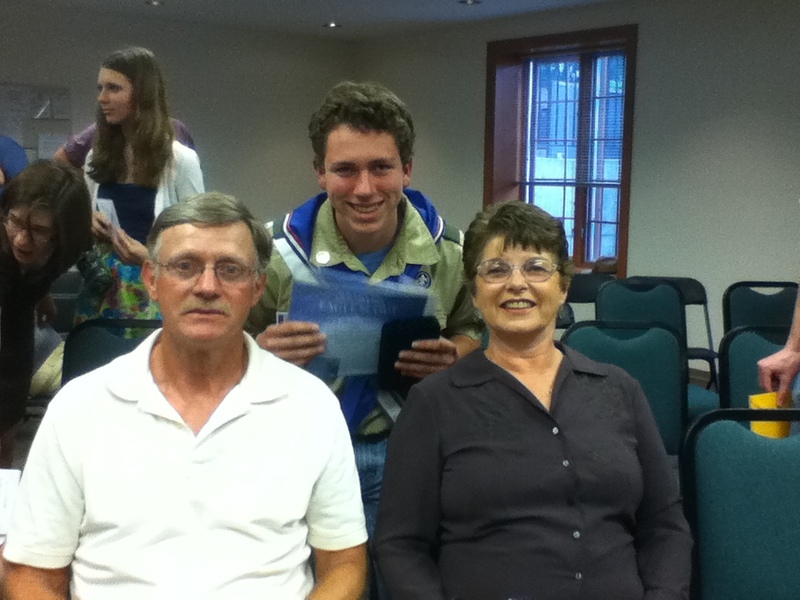 J with his maternal grandparents. They are also so proud of him! 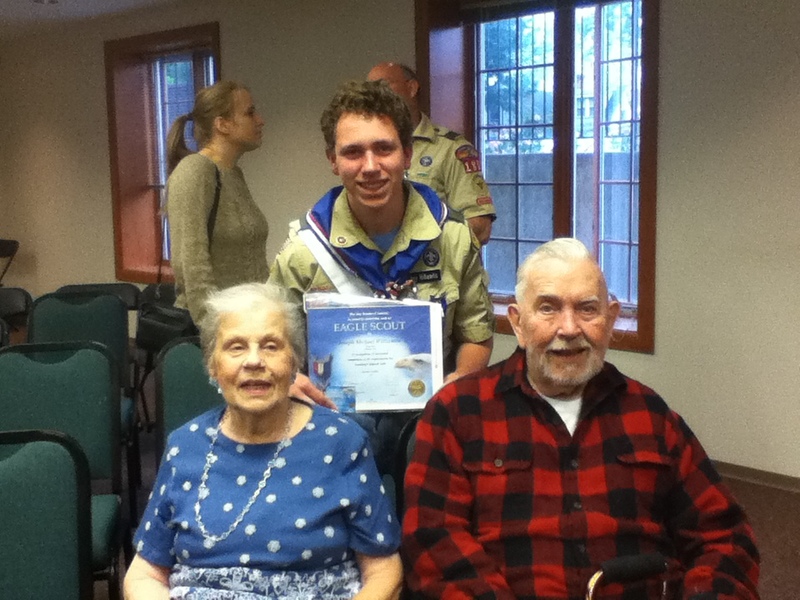 He is the first Eagle scout on this side of the family! J’s friends from school, who came to celebrate his award. Awesome job J! We are so proud of you! Keep up the good work! 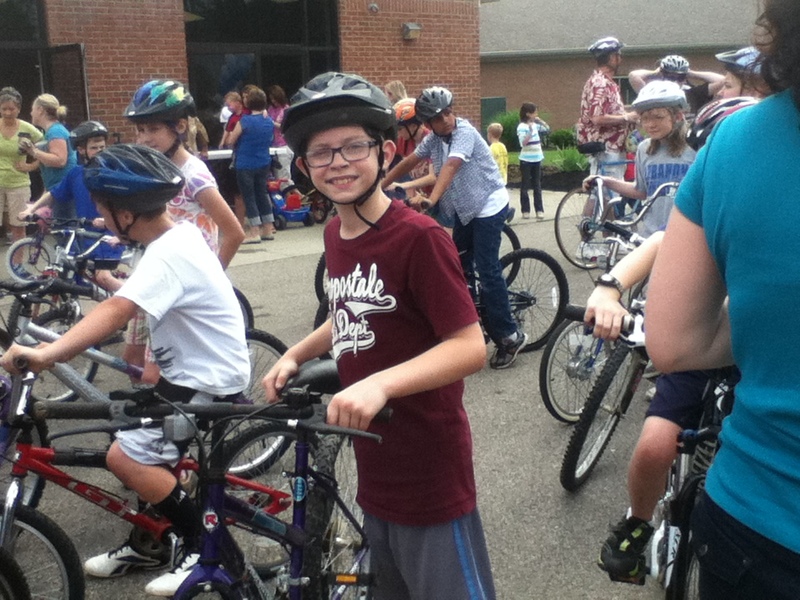 My younger children had a bike-a-thon for their school as a fundraiser. They love doing it. We have a bike trail very near to our school. The children ride for an hour. 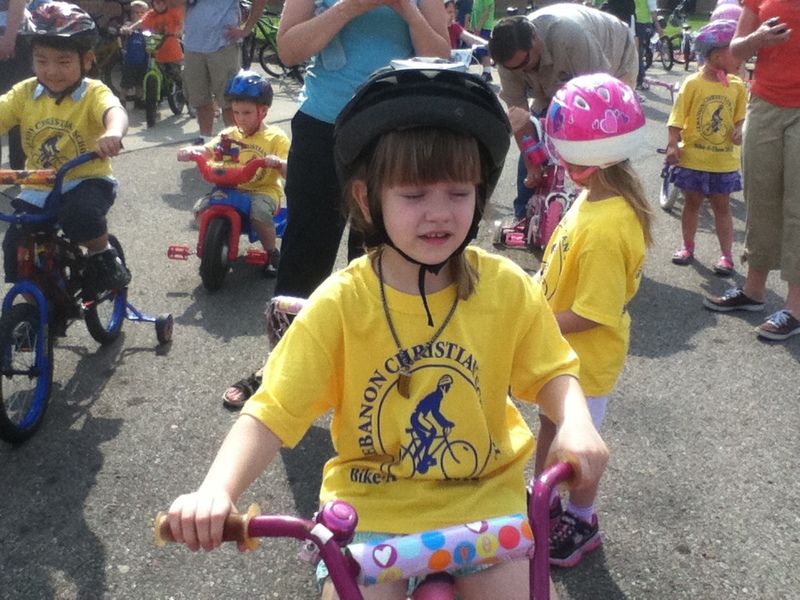 Preschool and Pre-k stay in the school parking lot and ride for 30 minutes in the area next to our flag pole. A by the balloon arch which is the start and finish for the bigger kids. T and the rest of the 4th graders getting ready to ride! This is always a good time for the children. 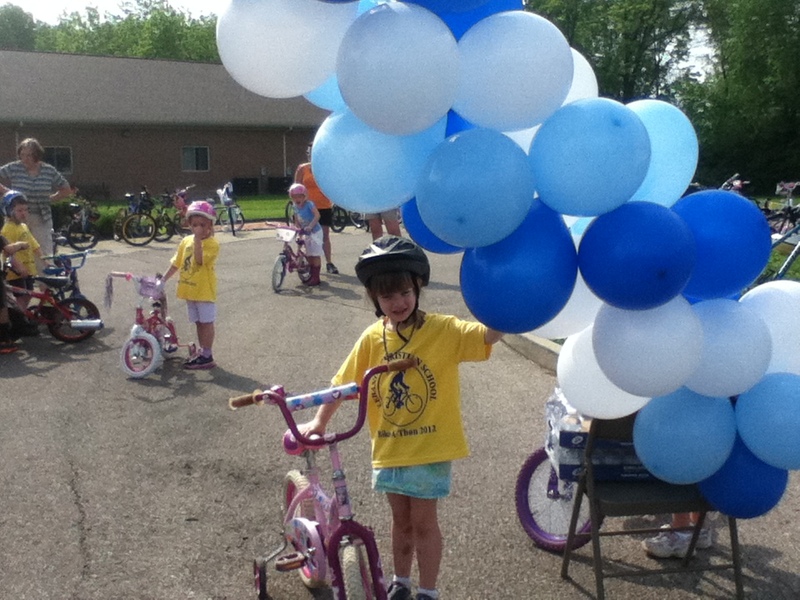 I don’t have pictures of all of my kids doing it, all from 8th down did the bike-a-thon and loved it! Here we are working out at our garden boxes. 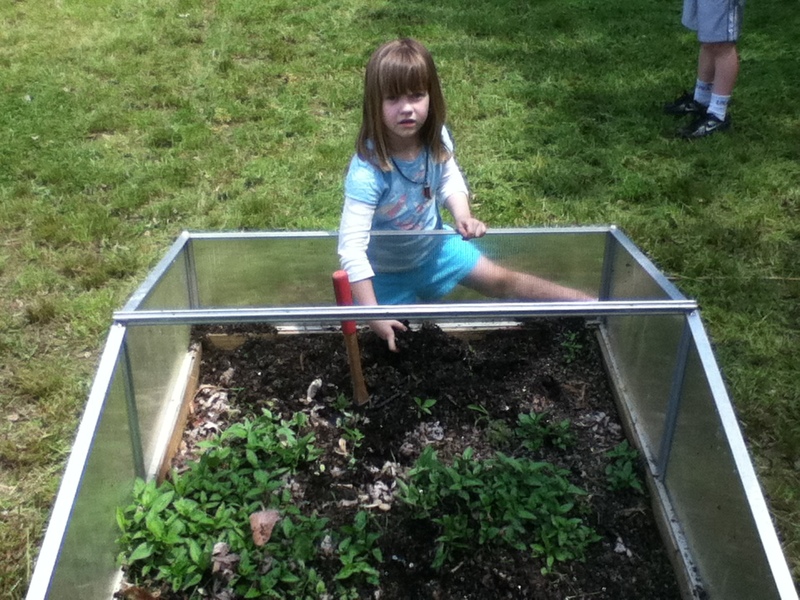 A is working on weeding our cold frame. Notice how dirty A has gotten during the weeding and planting process. I love it!! Our garden beds. There are six regular and one with a cold frame attached. The boxes need to be weeded desperately. In the distance one of the boys has “claimed” their box and started weeding. Waiting patiently to water the garden! Being outside is so much fun after being cooped up all winter! The rain has FINALLY stopped, for a while I hope. 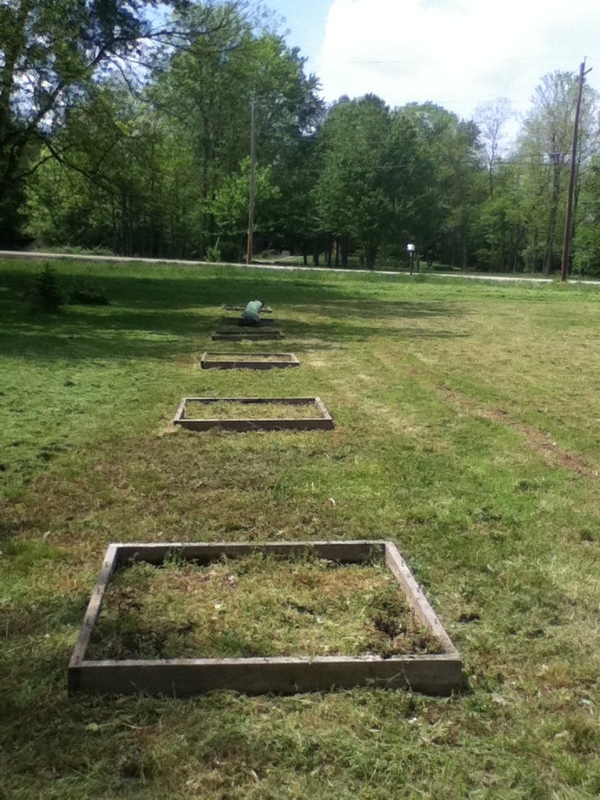 My husband and kids were out mowing where the garden boxes are located on our property. It was still pretty wet, but we had to get the stuff mowed. You know how it is. Anyway in an earlier post I said that I have 6 garden boxes, but I forgot that my husband put a 7th one in last year. It has a cold-frame on the top to help get seeds started. It is like a little mini greenhouse. 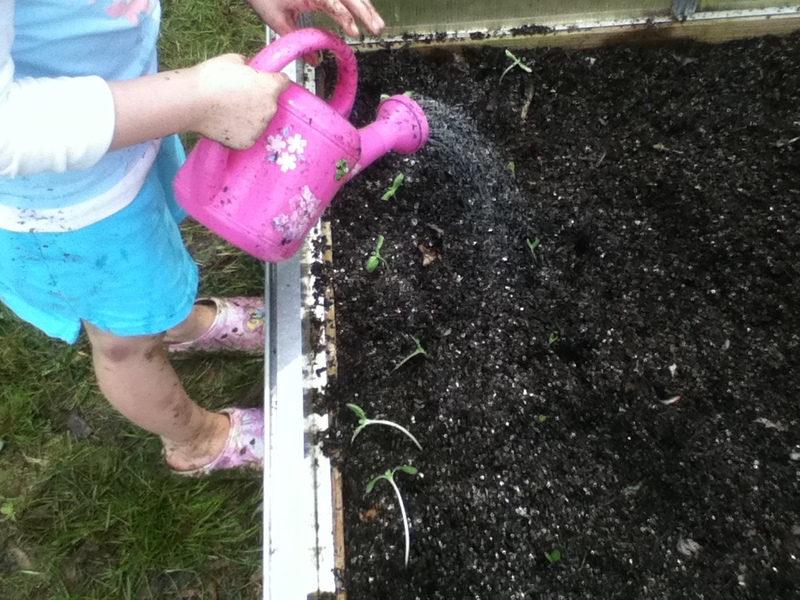 After the mowing was completed we (the kids and I) claimed our garden box for this summer. 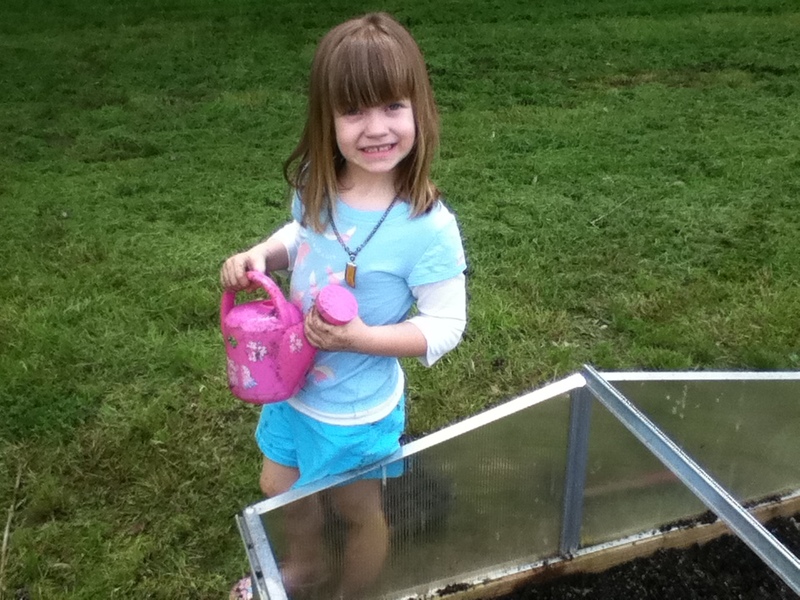 Each child gets a box to put whatever they want to grow in there for the season. It is also their responsibility to keep it weeded. We will see how this goes. So far there are 3 or 4 weeded (I can’t remember exactly) and we are getting ready to move forward. Spring is such a fun time. A time for renewal. A garden brings that feeling back to me after a long winter. I hope to be back soon. Life HAS to slow down soon because summer vacation is only 3 weeks away! Yahoo!